This week I take a look at apps coming from ‘across the pond’ and see what they have to offer. Uganda has been seeing some notable growth in terms of technology with many more brilliant minds coming up with applications and business ideas every day. I take a look at two applications, one that is a widely popular game and another from a startup that is hoping to add an application to support one of most our common trades with a little inspiration from the ever so popular app, Uber (and no, it is not another Uber-like transportation app). This has nothing to do with Matatus, absolutely nothing close to what we Kenyans associate Matatus with at least. This caught me off guard, but I had to remember that this is Ugandan, how silly would I be to assume that it may mean the same thing? It is a card game. I love card games. I love card games so much so that I often play 2- player games alone or even reconstruct ( or try to) computer games like Solitaire during blackouts, or…when I don’t have playing cards, I usually make some myself by cutting up paper and cardboard. I know, weird but I digress. This game has 100,000 (+) downloads on Play Store so it is right to assume that it is widely popular. On the main page, you can start appreciating the minimalistic design of this game. It’s pretty simple and clean with ‘floating’ buttons showing the 3 playing modes; Classic, Joker and 2 player. 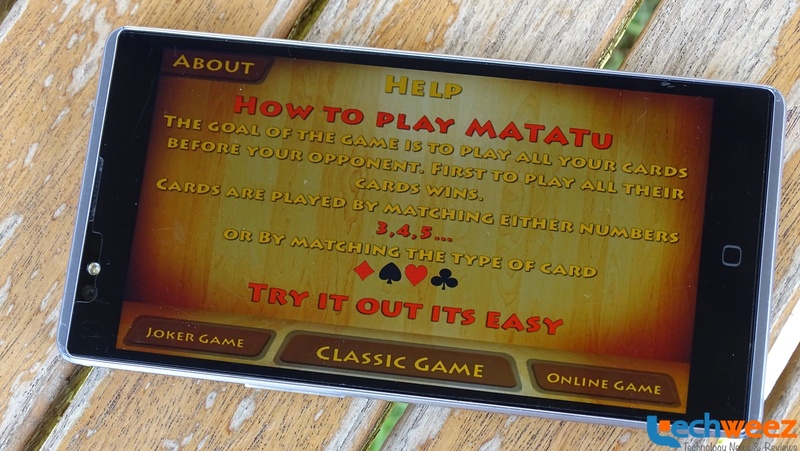 You can also see how many players are online, access help to know how to play Matatu, see the weekly leader board and your own profile, showing your points and a tab to customize the theme of the playing board. You can either get the default wooden board theme, another theme with the Ugandan flag as the backdrop or one of those casino blue flowery backdrops. One thing I noticed is that the game automatically picked up my Gmail username as my game play username if I choose to skip logging in with Facebook. I didn’t like that since it didn’t ask me if it was okay to do that. You can still log in with Facebook, at least there you have a choice. Yes, yes it is. At first I wasn’t sure I understood how to play it after reading the tutorial but I played a game with some tips and tricks until I figured out that it was almost exactly like the poker we grew up playing. Note, I say ‘almost exactly like’. This can be because of one of these two reasons. When I first played this game, I thought that maybe these are the set rules, the originals, the ones that were made at the beginning to govern the game by our forefathers. Or, maybe Ugandans just play it like this. That makes sense. I don’t know why I would assume it would be the same thing. Again. Point it, it’s an easy to learn game, just need a little rewiring before you can win a game. Took me 5 tries but I finally got a hang of it but when I did, I spent a very long time on it. It is very addictive. If you are tired of beating the computer, you can challenge someone from those online and hope one of them is up for the challenge. I prefer playing with humans other than a computer so I love the fact that that option exists in this game. I can see how this game got this popular. It is a fun and social game that you probably play with your friends so it’s one of those that can travel very fast through word of mouth. The guys who made this game, Kola Studios, have a number of other games available which are also good, but none is as popular as Matatu. Why don’t you give it a go? Did I mention that I saw no ads while I played this game and I was online?? I know you have moments where you look at that big pile of dirty clothes tucked away in a corner somewhere and wonder how you can change that to a clean, wonderfully smelling clothes without doing the actual work. You will probably consider hiring someone to do that for you. Dubbed as the Uber for dirty laundry, the basic premise here is that using the app, you can find the nearest person around who offers laundry services. This is perfect for those with busy careers (or those who simply do not like to wash clothes) to get their laundry done. This is not a new concept as this is something that is very popular here. During weekends and holidays, you cannot miss the people who sit outside estates and gates waiting for cleaning jobs from washing clothes to cleaning up the house and so forth. What these guys from Uganda did was create an app for that. One that connects you to the people who want the job nearest to you. Using the app, you get two options, either book a washer or look for dry cleaning services. When you choose to book a washer, you enter some specifics of the job you want. Do you want them to clean your clothes, your house or both? Do you want a man or a woman? How often do you need the service? This time only, weekly or monthly? What is your location and phone number? For laundry services, you list the laundry items, your location and date and time for pick up. Everything is well listed and explained, so using the application seems pretty straight forward. I couldn’t try this application as I am not in Uganda. Also in case the washer does not have a smartphone to install the app on, Yoza come in the middle there to complete that line of communication. You can subscribe to this service, with four subscription models; Student at UGX 100,000 (approx. Kshs 3013) for 4 months for 16 washes, Standard at UGX 120,000 (approx. Kshs 3616) for 3 months covering 12 washes, Premium package at UGX 240,000 (approx. Kshs 7241) for 3 months, 12 washes, house cleaning and ironing of clothes and lastly, Family for UGX 1,000,000 (approx. Kshs 30,131) for 6 months covering 50 washes, twice a week plus washing the house and ironing clothes. My thoughts on this are pretty simple. Most of the time, when you hire someone to do your laundry, in most cases, you will look for the same person every time, so the idea of using the app to get a new person, or the ‘nearest one’ each week can be lost , however, if you look at it at the point of discovery, such that you eliminate the walk to find this said person who sit outside there, many of whom may come from far places, then using the app to find someone who suits you better in the long run makes sense. I believe this is their ploy, but that is just an assumption. So that’s it for Uganda right now, ill still be on the look out for apps that seem interesting, useful and fun! Previous articleSnapchat updates Chat with video calling, stickers and voice notes.